Cher has confirmed she and Lady Gaga are to duet on a new song. The 66-year-old singer and actress revealed on Twitter that she is working with producer Timbaland on a new studio album to be released in time for Christmas. Gaga will feature on one of the tracks, with the working title The Greatest Thing. Cher tweeted: "Think ALL SONGS R Great so Far & I'm not Big Fan! GREAT Writers! GAGA IS MAJOR & Her VOCAL IS AMAZING! KUK (Kuk Harrell, American songwriter and producer) Heard [The Greatest Thing] Last nite 4 1st Time & FREAKED." The Mermaids star tweeted pictures of herself in a lavish recording studio dressed in a skimpy neon pink top, jeans and blue Ugg boots. She then revealed she had finished the album but added "Gaga might want to tweak" the track she featured on, but it made her want to "jump on my trampoline to it". 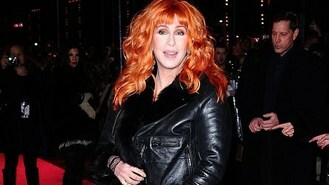 Cher added that her record company were making sure the album was kept top secret so the title of the song may change. She added: "Finished Song! I LOVE IT! Cant tell names of songs cause Record CO. gave Strict ORDERS! THINK 1st Single drops Oct. then cd near Xmas." One Direction had 12 million reasons to celebrate their success last night. Conor Maynard has insisted that he is different from Justin Bieber. Sir David Attenborough is teaming up with eccentric Icelandic pop star Bjork for a new music documentary. Steven Tyler has said he liked the pay cheques on American Idol but had a love-hate relationship with the show. Selena Gomez has admitted she doesn't really "feel accomplished" when it comes to her acting. A group of leading musicians has called on Russia's president Vladimir Putin to give a fair hearing to members of a punk band facing prison for performing a "legitimate protest". Conor Maynard has returned to his home town to meet hundreds of fans at an album signing and play a homecoming gig. The Olympics effect has hit the charts with Arctic Monkeys and Mike Oldfield among the stars benefiting from their appearance at Danny Boyle's opening ceremony. Carly Rae Jepsen has revealed she has been "sworn to secrecy" about her collaboration with Justin Bieber.